Create and present crisp charts, graphs and spreadsheets using your copier or printer. With color printers and copiers, transparency films produce vibrant colors for eye-catching presentations. For color laser printers and copiers not requiring a side stripe including HP Color LaserJet series and Tektronix series. Create and present crisp charts, graphs and spreadsheets using your copier or printer. 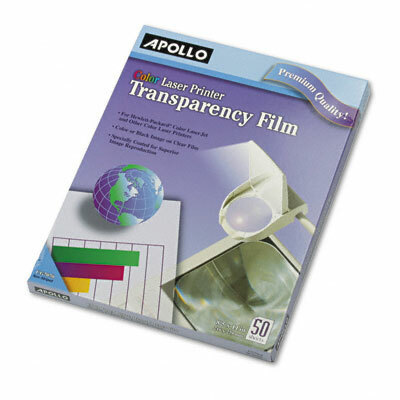 With color printers and copiers, transparency films produce vibrant colors for eye-catching presentations. Manufactured from the highest quality materials. Special coatings for reliable feeding, superior image adhesion and no static. For color laser printers and copiers not requiring a side stripe including HP Color LaserJet series and Tektronix series.